Spicier than a Habanero pepper is our passion for great Mexican food. Despite having a deep love for the cuisine, simply cooking and eating it wasn't enough for us, and after becoming master chefs, all we wanted to do was share our food. 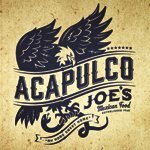 Acapulco Joe's was established out of a desire to share.Within Mexican cuisine, we specialize in cuisine from the Western Coast. We're different from the average Mexican Restaurant, with everything from the way we prepare our food to the spices we source for authenticity.